Much of the world is covered with grasses. These grasslands are generally classified as either tropical or temperate. Natural grasslands have developed over thousands of years as plants, soil, and animals give and take from each other in a balanced continuum. Man has tried to utilize the grasslands and create man-made grasslands with both successful and disasterous results. 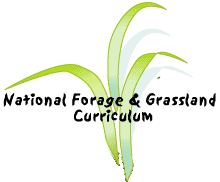 Although grasslands have some common characteristics, they are each a unique cycle and the animals and plants that exist on each provide an amazing array of variety, but they must be managed specifically and properly if they are to continue to provide food for mankind and animals. Many crops that are mismanaged will produce less yield, but quality is not always directly affected. Mismanagement of forages often produces less yield and lower quality as well. Overstocking, water quality and availability, plant selection, appropriate land use, proper fertilization, pests management, desertification, and deforestation are only a few of the problems facing management decisions. The growing world population does not have the land or time to wait for new grassland to develop.